Hello! 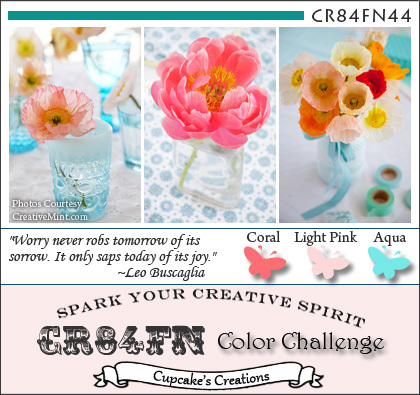 This is my last post as the Guest Designer for CR84FN Color Challenge! I have had so much fun being a part of this fabulous team! I just want to thank Mona and all the wonderful designers at CR84FN Color Challenge for inviting me to be a guest designer for the last few weeks. You all made me feel so welcome! It has been such an honor! Don't ya just love this paper! This paper is from Basic Grey's Out of Print 6x6 paper pad. The colors were a perfect match for this color challenge! First, I hand stitched the zigzags with my Sew Easy tool and pink floss. I then made a layer of aqua ribbon, a strip of DP and a die cut (Spellbinders) of aqua card stock, and placed it in the middle of the card. I stamped the sentiment onto die cuts, all from Verve. The sentiment area looked a little flat, so I die cut some hearts (Verve) out of DP and the aqua cardstock. I think this gave the card more depth...a little more oomph! 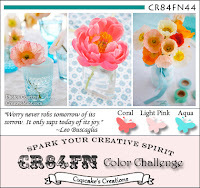 Finally, I added the light coral Prima chiffon flower and 3 pink & coral buttons. Now go check out all the other designer's beautiful creations! Gorgeous card Mackie! Love those pretty little hearts and the delicate blossom! Your pink stitching looks awesome! Thanks so much for being our guest at CR84FN ~ we surely have enjoyed your projects! Happy Holidays! holey moley!! this is some kind of wonderful!! so many absolutely gorgeous details.... wow!! Gorgeous card, Mackie! Love your choice of PP (it is perfect for the color combination) and the hearts and blossom are SO sweet! Thank you SO much for joining us as Guest Designer and for sharing your beautiful projects each week! Beautiful paper and the design is fabulous! Gorgeous card. Such a beautiful card Mackie! WOW! Truly stunning! Very pretty Mackie! Sweet layers of frilly girliness!!! Mackie, your card is just so GORGEOUS! LOVE that paper and LOVE that chiffon flower! You are so right about the hearts! They really add so much! Wonderful card by our Wonderful Guest Designer! Marvelous card, Mackie. Love the different layers and textures. The hearts are just adorable. Beautiful BD card, love all your added embellies! The Basic Grey papers look wonderful with this week challenge! SO glad you joined us this month as our Guest Designer! Mackie - sorry to be so late commenting on your beautiful birthday card. I adore that paper, it really is perfect for the colours. So many lovely details - the hand stitching is fab!!! Love the chiffon flower and sweet hearts. It's simply faboulous! So glad that you joined us as our Guest Designer! It turned out great! I like the skewed sentiment panel and those sweet little hearts you added.